At the end of the season, Nationals star Bryce Harper is slated to become a free agent. Bryce Harper's days as a Washington National are numbered. But could the overwhelming support of true Nationals fans who have rooted for Bryce Harper for the past seven years be enough to convince the 2015 National League MVP and this year’s Home Run Derby winner to stay with Washington? Nationals fans remember when the teenage phenom was picked first overall by the Washington Nationals in the 2010 draft. In 2012, he was named the National League Rookie of the year, and over the past seven years, Harper has broken MLB records and won numerous awards. In 2015, his MVP year, Harper had 42 home runs and placed first in the league in on-base percentage and slugging. At 25 years old, Harper is nowhere near the end of his major league career. The awards he's racked up are impressive: Bryce Harper has been selected for six of seven all-star games, been in the running for 3 MVP awards, and received a Silver Slugger, Hank Aaron, and Golden Spikes awards. So, is this Harper’s last year as a National? 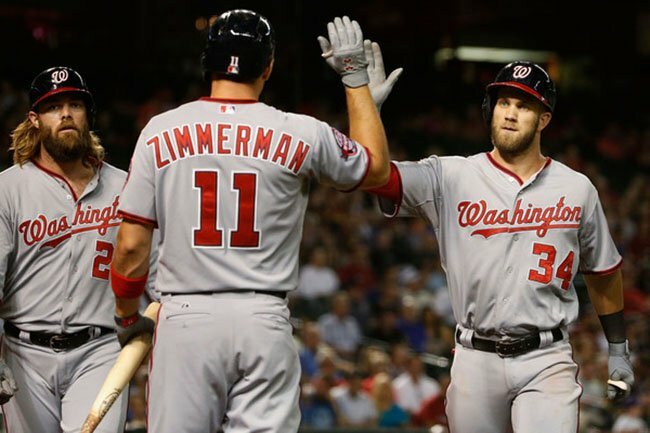 Unlike Jason Werth, who retired a National this past year, and Ryan Zimmerman who will retire (one day) as a Washington National, Harper may very well wear a different uniform next year unless the Lerners give him a worthy contract. Mathematically, we’re not out of the playoff hunt yet, but each Nats loss and Braves win puts us farther out of the post-season picture. In most fans' minds, the season is already over. Some fans I spoke with at a game a couple of weeks ago all agreed that the trading off of great and beloved players like Daniel Murphy, Matt Adams, and Gio Gonzalez, all was to make room for Harper’s big contract next year. Rizzo answer -- that he wasn’t sure what the club was planning, but that the fans would most likely acknowledge Harper at the last home game -- was a little disturbing. There wasn’t a question whether Harper was staying, but an assumption that he wasn’t. "I would imagine the fans are going to really embrace it and really acknowledge Harp," Rizzo told the listening audience. At the end of this season (that’s just a couple of weeks away), Harper will be a free agent. And we all know that his agent, Scott Boros, is fighting to get him a record-breaking contract. He’s probably been talking to teams for several months, getting a feel of what they can expect to get. That’s the agent’s job. I don’t blame him for trying to get his players the best deals. We can only hope that Nats fans take his advice. Give Haprer the big sendoff he deserves -- not because you think he’s really leaving, but to show him how much this city loves him and wants him to stay. I don’t think another team’s fans will appreciate him the same way that we do in DC. The big question is, will the Washington Nationals be part of the fight for Harper, or will the big dollar signs cause fans to stand back and watch the highest bidder take one of the greatest National players we’ve ever had. Are you rooting for Bryce Harper to re-sign with the Nationals? Tell us your thoughts in the comments below. Going to Nationals Park in the next few weeks? Here's what you should do while you're there.